Haggay Evyatar Fire Defense Systems, Ltd. was founded in 2003 and provides services including the installation, planning, service and supply of sprinkler systems. Various Types of Sprinkler Systems: Wet, Dry, Foam and more. Fire Pumps: Diesel, Electric, Pressure Enhancement, installation of fire detection systems. Haggay Evyatar Fire Defense Systems, Ltd. has wide and varied experience from over 15 years in the field of fire extinguishing. Precision installation of the various accessories of a system based on manufacturers’ instructions. Precision installation of systems in accordance with accepted standards. Minimum impairment to facilities during installation or inspection of sprinkler systems. Maximum compatibility to the needs and demands of the customer regarding planning, installation and all work conducted on-site. Work sites are left clean and organized following installations or inspections. Haggay Evyatar Fire Defense Systems, Ltd., provides maintenance services and inspections for existing systems and provides proper certification for fire fighting services, insurance companies and business licenses. Owner and CEO Haggay Evyatar has over 15 years experience in fire fighting systems. Reliable training in safety under the guidance of the Contractors’ Forum. Continuing and on-going certification after initial training. 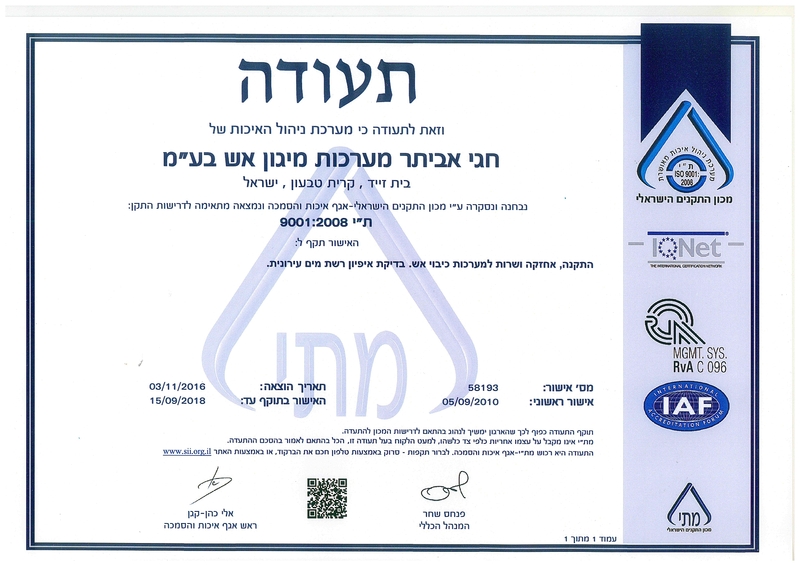 All work performed by Haggay Evyatar Fire Defense Systems, Ltd. including all planning, supply and installation of sprinkler systems are carried out in accordance with the exacting standards of the relevant Israeli bodies, and in accordance with the standards of the N.F.P.A. and manufacturers’ instructions. Haggay Evyatar Fire Defense Systems, Ltd. employs a trained and experienced staff in order to provide our customers with training and use of all models and types of fire extinguishing systems. Training and use of fire fighting equipment is given to factory/plant/facility staff, military units for operational training purposes, and the training of department heads for emergency procedures in factories and institutions. The Company owns a wide variety of vehicles specifically for providing services in situations of fast response time. Electric Technicians, Senior Electricians and Electrical Inspector – Grad Fire Extinguishing Systems Designer including hydraulic calculations. Welders, pipe and equipment installation. THE COMPANY HAS ALL OF THE TECHNICAL RESOURCES AND TOOLS TO PROVIDE INSTALLATION SYSTEMS AND CREATE ALL NEEDED APPARATUS.